I was leafing through Le Monde earlier (in a social-media type of way) and a couple more trifles concerning the Charlie Hebdo attacks last week and/or the massive marche républicaine on Sunday caught my eye. In the name of what did the representatives of regimes who are predators of freedom of the press come to parade in Paris in homage to a newspaper which always defended the highest conception of liberty of expression? The piece goes on to list the RSF press-freedom rankings (180 = worst) of some of the leaders marching there: 98 (Gabon), 118 (UAE), 141 (Jordan), 148 (Russia) 154 (Turkey) and 159 (Egypt). It all may make you want to ask . . .
Who Is A Real Jackass? We dealt here yesterday with Bibi Netanyahu’s misbehavior around the ceremony, mainly the curious fact that neither he nor Mahmoud Abbas were originally supposed to be there at all, but he was not the only one acting up. Nicolas Sarkozy is a former President of the French Republic, you’ll recall, but right at this moment he is only president of the Union pour un mouvement populaire (UMP). True, that is probably the main opposition party on the Right (depending on where you want to place Marine Le Pen’s Front National), but that did not get Nicolas any front-row position during the march: that was reserved for actual heads of state/government, and indeed the prime spots close to the host, President Hollande, were only for the particularly notable (Angela Merkel; EU Commission Head Jean-Claude Juncker; Mali President Ibrahim Keita, in the black hat – France still has troops there) or the pushy/obnoxious (Netanyahu). He couldn’t be the former, so Sarkozy clearly decided that, come what may, he would get himself a front-row spot by being the latter. You’ll notice in that Twitter-picture how he’s pretty much there; well, that took some effort, as you can see for yourself if click through to the article, where there is a delightful embedded video from the French Huffington Post that tracks his maneuvers, from the march’s very beginning where you see him being instructed to please step back from the front row. Keep you eye out for that particularly sharp maneuver toward the front he manages when the line of marchers has to make way to either side while passing some traffic pole so that a gap temporarily opens up! Note as well that it’s not just him, but also his famous singer/wife Carla (the one with the well-coiffed blondish-brown hair) who faithfully follows him in all these maneuvers; she’s actually quite a bit taller than him, so that sometimes it’s easier to look for her than for Sarkozy himself to see where they are at a particular moment, including in the still photos that are also displayed in this Le Monde piece. The only time it’s really a mystery is in the bottom photo, the one that shows the mass of marchers pausing for a minute’s silence; you’d have to think that it’s that mysterious hand resting on Netanyahu’s left shoulder that is Sarko (or is it even pulling Bibi back, ready for one last maneuver?). Disgraceful? Amusing? I think more the latter, but revealing as well about the pettiness (also in physical stature) of the man who is trying to set himself up to become France’s president once again. What is disgraceful – to repeat – is the presence there, at a massive ceremony to honor heroes of free expression, of so many leaders of governments who regularly abuse that right to free expression – including most particularly Hollande himself! 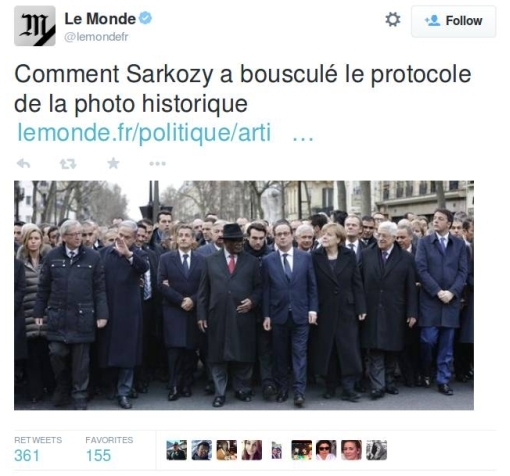 Of course, there had to be some ceremony to honor the twelve who lost their lives their in the Charle Hebdo office, and once other national leaders express their desire to be there, it’s basically impossible to start telling them “No” based on their policies towards a free media – or for almost any other reason. The natural solution was for there to be a ceremony without any politicians! There are surely plenty of people who could have set up and run even this sort of mass march through the city, coordinating in a businesslike way with the police and other city services. 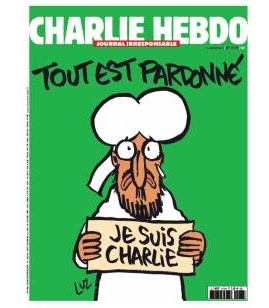 That would also have sent a handy demand to the French government to actually permit the degree of press freedom that the Charlie Hebdo staff – yes, with all their obscene, disgraceful writings and drawings – had advocated and stood for. 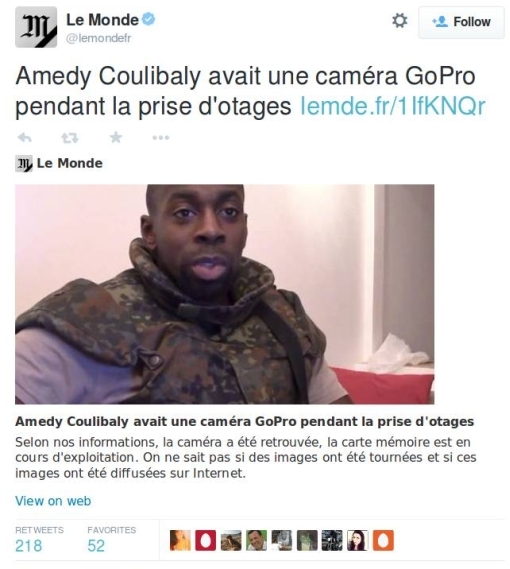 Amedy Coulibaly, he who killed four hostages at the Vincennes Jewish supermarket, wired himself up with a GoPro camera to catch all the action! That is in the hands of the authorities’ hands now, of course. Not only that, but according to a witness, Coulibaly also brought along a laptop to his hostage-taking, at one point put the GoPro’s memory card into it to do a bit of video-editing. For that matter, it says here the Kouachi brothers were also carrying along a GoPro camera, but left it behind in one of the cars they hijacked and then abandoned. Yes, the things don’t weigh much – they’re wearable, as we know – and are expensive, but you have to recall that at least one of the Kouachis also left behind his ID card in the black car they used to drive to the Charlie Hebdo offices, so they weren’t very good at holding on to things.